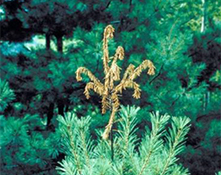 It is known to attack a wide variety of Pine and Spruce trees, but most commonly found in White Pine and Norway Spruce. This weevil kills the top 2-3 years of growth on the host tree, causing homeowners a great deal of concern. 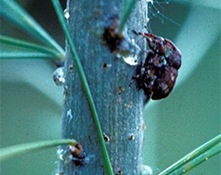 Weevil attack does not kill the entire tree, although it may become crooked and limby as a result of repeated top killing. While the weevils are feeding, the current year’s flush of growth starts but soon droops, producing the symptom know as “shepherd’s crook.” Both adults and larvae feed on shoots and needles and can severely distort terminals and stunt plant growth. Adults usually overwinter in the litter on the ground. In the spring adults fly or crawl to the leaders of suitable host trees. Mating takes place on the leader, where from one to a dozen or more pairs may gather. The female excavates a round hole in the bark and deposits one to five eggs into the cavity. She then fills the hole with a plug of mascerated bark. Hundreds of eggs may be deposited in a single leader. 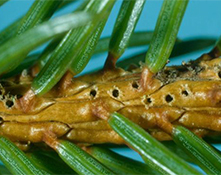 The eggs hatch and the larvae feed in the bark, killing the leader of the previous year. The larvae bore into the wood and produce pupal chambers filled with shredded wood and bark. The new adults leave the host by late summer and do some feeding on twigs prior to overwintering. In April treat the vertical terminals. Remove and destroy infested, flagging leaders in June and July.